AKA: Mir EO-11;Soyuz TM-14 (Kaleri, Viktorenko);Vityaz (Knight). Launched: 1992-03-17. Returned: 1992-08-10. Number crew: 2 . Duration: 145.59 days. Joint flight with Germany. Docked at the Kvant rear port at 12:33 GMT on March 19. The Soyuz TM-14 crew, Aleksandr Viktorenko and Aleksandr Kaleri, returned to Earth together with French astronaut Michel Tognini. The Soyuz TM-14 undocked from Mir at 21:47 GMT on Aug 9, and landed in Kazakhstan at 01:07 GMT on August 10. Family: Manned spaceflight. People: Kaleri, Viktorenko. Spacecraft: Soyuz TM. 1992 March 17 - . 10:54 GMT - . Launch Site: Baikonur. Launch Complex: Baikonur LC1. LV Family: R-7. Launch Vehicle: Soyuz-U2. Soyuz TM-14 - . Call Sign: Vityaz (Knight ). Crew: Flade, Kaleri, Viktorenko. Backup Crew: Avdeyev, Ewald, Solovyov. Payload: Soyuz TM s/n 64. Mass: 7,150 kg (15,760 lb). Nation: Russia. Agency: MOM. Program: Mir. Class: Manned. Type: Manned spacecraft. Flight: Soyuz TM-12 Mir LD-3, Soyuz TM-13, Soyuz TM-14, Soyuz TM-14 Mir 92. Spacecraft Bus: Soyuz. Spacecraft: Soyuz TM. Duration: 145.59 days. Decay Date: 1992-08-10 . USAF Sat Cat: 21908 . COSPAR: 1992-014A. Apogee: 394 km (244 mi). Perigee: 373 km (231 mi). Inclination: 51.60 deg. Period: 92.20 min. Mir Expedition EO-11. Joint flight with Germany. Docked at the Kvant rear port at 12:33 GMT on March 19..
1992 March 25 - . Landing of Soyuz TM-13 - . Return Crew: Flade, Krikalyov, Volkov, Aleksandr. Nation: Russia. Related Persons: Flade, Krikalyov, Volkov, Aleksandr. Program: Mir. Flight: Soyuz TM-12 Mir LD-3, Soyuz TM-13, Soyuz TM-14, Soyuz TM-14 Mir 92. Soyuz TM-13 landed at 08:51 GMT with the crew of Flade, Krikalyov and Volkov Aleksandr aboard..
1992 April 19 - . 21:29 GMT - . Launch Site: Baikonur. Launch Complex: Baikonur LC1. LV Family: R-7. Launch Vehicle: Soyuz-U2. Progress M-12 - . Payload: Progress M s/n 213. Mass: 7,320 kg (16,130 lb). Nation: Russia. Agency: MOM. Program: Mir. Class: Manned. Type: Manned logistics spacecraft. Flight: Soyuz TM-14. Spacecraft Bus: Soyuz. Spacecraft: Progress M. Duration: 69.11 days. Decay Date: 1992-06-27 . USAF Sat Cat: 21946 . COSPAR: 1992-022A. Apogee: 394 km (244 mi). Perigee: 373 km (231 mi). Inclination: 51.60 deg. Period: 92.20 min. Unmanned resupply vessel to Mir. Docked with Mir on 21 Apr 1992 23:21:59 GMT. Undocked on 27 Jun 1992 21:34:44 GMT. Destroyed in reentry on 28 Jun 1992 00:02:51 GMT. Total free-flight time 2.18 days. Total docked time 66.93 days..
VBK Raduga - . Mass: 7,450 kg (16,420 lb). Nation: Russia. Agency: UNKS. Program: Mir. Flight: Soyuz TM-14. Spacecraft Bus: Soyuz. Spacecraft: Progress M. COSPAR: 1992-022xx. 1992 May 30 - . Mir News 132: Experiments have priority. - . Nation: Russia. Program: Mir. Flight: Soyuz TM-14. The cosmonauts o.b. Mir have been working on experiments instead of repairing and replacing life-support equipment. They used a camera named Liva for earth-observations and mentioned the areas of which they had to make video recordings. The crew also used equipment for the Austrian experiments of Austromir. They worked on a few of those experiments in co-ordination with an expert on TsUP. Monimir (reflexes under micro-gravity) and Migmas (raster ion microscope) of which the data with the device Datamir are transmitted via Mir's telemetry Monimir (reflexes under micro-gravity) and Migmas (raster ion microscope) of which_the_data_with_the_device_Datamir_are_transmitted_via_Mir's_telemetry channels. The continuation of experiments with equipment left behind by guest cosmonauts must be of a great advantage: funds for Russian spaceflight and the fact that the Austrians have constructed the equipment not only for the short stay on board Mir of Franz Viehbock in Oct. 1991. THE EX-TRACKING FLEET: Some of the ships of that fleet are still seaborne, but not for tracking or relay purposes. During the last weeks there have been messages that the Kosmonavt Yuriy Gagarin, the K. G. Dobrovolskiy, the K.V. Komarov and the K.P. Belyayev left their home ports. Obviously the ships made short cruises. It took some investigation work to get the following information: the Russians decided to keep the ships floating and to maintain the original shape as to make the ships 'attractive' for foreigners during cruises and business trips and eventual expeditions. Important persons involved in spaceflight, science and commerce founded some organisations to use the ships for cruises and business promotion trips. They already started one or more cruises. One of the travel agencies is leaded by the former cosmonaut Beregovoy. If they pay 350 thousand rubles cosmonauts and spaceflight employees can enjoy a cruise. A few days ago the Kosmonavt Pavel Belyayev showed up in radio contacts with the Mir station. So just as it has been before: Mir traffic in the West while Mir was still out of range of Yevpatoriya. The Belyayev visited Hamburg with the Mir station. So just as it has been before: Mir traffic in the West while Mir was still out of range of Yevpatoriya. The Belyayev visited Hamburg and the mayor of that city greeted the cosmonauts. Some experts on board kept the transceiver for Mir communications in good order and the scientist and tradesmen on board Belyayev spoke with the cosmonauts. The ship does not work for TsUP and on 30 May, during orbit 35950, 1106-1117 UTC wondered with whom the crew has been speaking. On 1 June the ship will visit London and some important passengers on board will speak with Mir during orbits 35982 (1049-1100 UTC) and 35983 (1225-1235 UTC). Some scientist and tradesmen on board will try to promote Russian products and look for partners for commercial and scientific co-operation. There will be not much propaganda for spaceflight for they do not have much material on board. They have photographs, but no TV-films. Viktorenko told the ship that he regretted this. The Belyayev will be involved in a number of events in relation to the Columbus-92 expeditions and Viktorenko promised that the Mir-crew if necessary and possible will co-operate and assist. There are rumours that an ex-tracking ship (Belyayev or Dobrovolskiy) will visit Rotterdam for 2 days around 10 June 1992. 1992 June 27 - . Mir News 134: Progress-M13 - . Nation: Russia. Program: Mir. Flight: Soyuz TM-14. Launch of this freighter still on schedule for 30 June 1992. Russian spaceflight authorities now have to take in account interests and feelings of the population, about which they - under protection of the former Soviet Mil. Industrial complex- never bothered. The people living in the Novosibirsk area always feared launches from Baykonur. After launches parts of the rockets (1st stages, hatches, etc.) fall down in that area. Thus far no accidents or damages have been reported -this in contradiction to the ground track areas in Kazakhstan-, but people is always aware of space-launch hazards. To cultivate more goodwill and understanding for space-flight the Baykonur launch-site authorities invited representatives of the administration, civil defence and press of the Novosibirsk region to attend the launch of Progress-M13 on the spot. This EVA will take place on 8 or 10 July 1992. The work to be done by the cosmonauts during that EVA is crucial for the operational existence of the Mir complex. 4 of the 6 gyrodynes in Module-D are out of order and so the attitude control of the complex is working unsatisfactorily. For the repair work during the next EVA equipment and tools have to be delivered to Mir by Progress-M13 on 2 July 1992. In the future more work to restore the SUD (movements control system) must be done. For a provisional solution (to keep control on the roll, X- axis, of the complex)f the next crew (Solovyov and Avdeyev) will have to install the VDU (external movements control motor) in the top of the Sofora girder. 1992 June 28 - . Mir News 135: Progress-M12 - . Nation: Russia. Program: Mir. Flight: Soyuz TM-14. To make the docking of the freighter Progress-M13 on 2 July 1992 possible, the Progress-M12 had to disappear. Progress-M12 had been docked to the forward docking port (PKhO) on 22 April and was often used to correct the orbit of the complex. This also happened a few days ago and so only Kepler elements from day 178 or younger are useable. Radio traffic in the night from 27 to 28 June 1992 revealed that the undocking operation was going on. Kaleri watched the undocking and autonomous flight of Progress-M12 from the airlock (S.Sh.O.) of Module-D and Viktorenko observed all what was happening from the base block. During the pass in orb. 36394, which began at 2129 UTC, Progress-M12 separated from Mir. This was right over our heads at 2135 UTC. Telemetry and Doppler beacon (resp. on 166, 165 and 922.755 mc) could be heard. TsUP received TV images made by Kaleri. For a long time Mir and Progress-M12 flew in formation. During the next pass (in orb. 35395, 2306- UTC) Progress-M12 still flew autonomously still more or less observed by Kaleri. At 230654 UTC the exact TCA could be determined (922.755mc passed the BFO-dip). 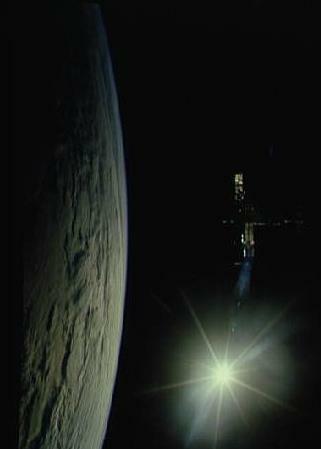 Almost on this moment Progress-M12's rocket worked to reduce its speed and it entered the earth's atmosphere. It decayed (burnt up) at 2321 UTC on 27 June 1992, so 9 minutes after our LOS. Progress-M12 had not been equipped with a return capsule. 1992 June 30 - . 16:43 GMT - . Launch Site: Baikonur. Launch Complex: Baikonur LC31. LV Family: R-7. Launch Vehicle: Soyuz-U2. Progress M-13 - . Payload: Progress M s/n 214. Mass: 7,320 kg (16,130 lb). Nation: Russia. Agency: MOM. Program: Mir. Class: Manned. Type: Manned logistics spacecraft. Flight: Soyuz TM-14. Spacecraft Bus: Soyuz. Spacecraft: Progress M. Duration: 23.64 days. Completed Operations Date: 1992-07-24 08:08:22 . Decay Date: 1992-07-24 08:08:22 . USAF Sat Cat: 22004 . COSPAR: 1992-035A. Apogee: 226 km (140 mi). Perigee: 185 km (114 mi). Inclination: 51.60 deg. Period: 88.60 min. Unmanned resupply vessel to Mir. An initial docking attempt on 2 Jul 1992 was a failure. 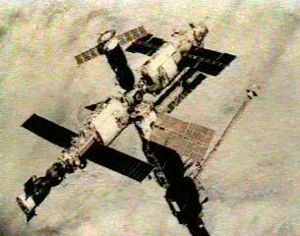 Docked with Mir on 4 Jul 1992 16:55:13 GMT. Undocked on 24 Jul 1992 04:14:00 GMT. Destroyed in reentry on 24 Jul 1992 08:03:35 GMT. Total free-flight time 4.17 days. Total docked time 19.47 days. It was docked to Mir for only a few weeks, since on 26 Jul the Soyuz TM-15 was to be launched with a replacement crew and would need to use the same docking port. 1992 July 4 - . Mir News 137: Progress-M13 - . Nation: Russia. Program: Mir. Flight: Soyuz TM-14. 2D DOCKING ATTEMPT SUCCESSFUL ON 4 JULY 1992 AT 1707 UTC. During the first pass here in orb. 36500, 1648-1653 UTC, Progress-M13 was still flying autonomously for she still transmitted on a frequency which has to be quiet during the final approach and after docking. Viktor (Savinykh or Afanasyev) on board of the former tracking ship Belyayev tried to get in touch with Mir, but Kaleri asked him to keep quiet for the docking operation was about to begin. Kaleri told TsUP that they did not see Progress-M13 neither visual nor on their screens. So for abt. 1.5 hour I did not know whether Progress-M13 had been docked or not. During the pass in the next orbit 36501, 1823-1841 UTC, the crew reported that the air-seal was perfect. Progress-M13 had been docked to Mir's forward port at 1707 UTC. Viktorenko told TsUP that they would open the hatch to Progress-M13 as soon as TsUP ordered them to do so. TsUP did this and the cosmonauts crept to the hatch and opened it at 1837 UTC. During the following pass Kaleri reported the good state of the Progress-M13: all was clean. Crew and TsUP exchanged congratulations and the crew thanked the specialists on TsUP for the excellent achievement and TsUP's care for the crew. 1992 July 8 - . 12:38 GMT - . EVA Mir EO-11-1 - . Crew: Kaleri, Viktorenko. EVA Duration: 0.0854 days. Nation: Russia. Related Persons: Kaleri, Viktorenko. Program: Mir. Class: Manned. Type: Manned space station. Flight: Soyuz TM-14. Spacecraft: Mir. Inspected gyrodyne orientation flywheels..